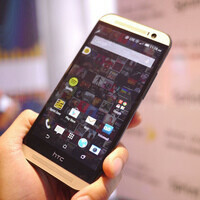 If you've been following the news closely, then you probably know that a Harman Kardon edition of the HTC One (M8) is launching on Sprint this coming Friday. The pimped out model comes with a unique, two-tone paint job, a pair of Harman Kardon AE-S headphones in the box, and Harman's Clari-Fi sound-enhancing feature. Never heard of the latter? Well, it is a clever piece of software that aims to restore the original fidelity of compressed digital music, and for now, it is only going to be available on Sprint's exclusive HTC One (M8) model. With a little hacking, however, anyone owning a standard HTC One (M8) can add some Clari-Fi goodness to it, and XDA Developers member baadnews is the one to thank for that. Just recently, he put together a how-to guide in which he describes the process in detail and even outlines solutions to errors that you may encounter along the way. But before you start tinkering with your HTC One (M8), you should be aware of a few things. First and foremost, you need root access for this hack to work. You should also be comfortable with flashing a few zip files using a custom recovery. And if you own the Google Play edition of the handset, don't even bother trying the hack as it will work only with HTC's Sense UI. If none of that bothers you, however, then feel free to follow the source link below. Drop us a line down in the comments if you get the hack to work. so it is not hardware thing ? One word : Viper4android Nothing to beat that. I found the z2 put out some superior sound with the embedded headphones. I was only a matter of time... The Android root community works lightning fast! so why are u here? i am using this phone since launch day, couple times had samsung galaxy s5 and z2 in my hands. s5 is to much plastic and bling bling UI is ugly, Z2 feels like brick. when i was buying htc m8 i was worried about size, but i will never go back to some crappy speakers like samsung, so this size is worth it! Exactly, I also own M8 and I like the feeling in my hands. The M8 can be operated with one hand due to curved back and its width as it is pretty narrow. I agree the size is worth as the HTC speakers are amazing. The S5 speaker is loud but the sound quality is awful compared to M8.